Discussion in 'Shotguns for sale or trade' started by Brawny, Nov 4, 2018. 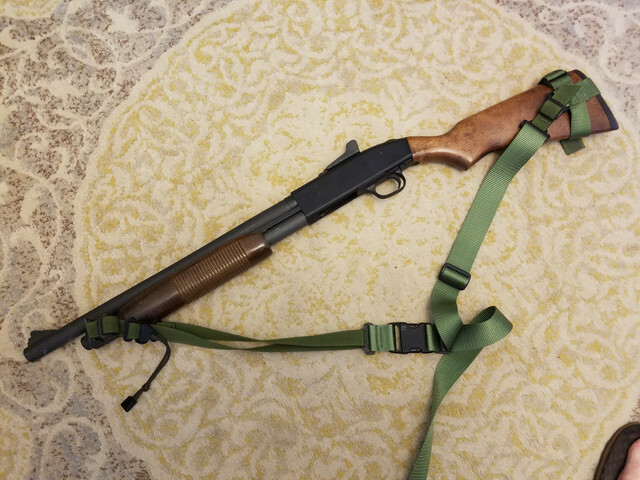 590a1, 18.5" barrel, 6+1 capacity with sling. Not shown is a set of magpul furniture included in price. I like the wood, myself. $375 cash, no trades please. ForumSurfer, Brangus, WadeWatts and 3 others like this. I like the old school look with the wood furniture. Sneakymedic, LizardKing, Brawny and 1 other person like this. Alright brothers, i got to get the armslist scammers off my jock. What a beauty. Be in my hands if I was in NC. I'll be near Charlotte Thanksgiving Day, and I'll be near Asheville December 8-10. Obviously. I assumed, perhaps wrongly, that there would be an ffl in Ashville, or any other town in NC. I figured you were an NC resident living in SC or we’d stop by an FFL. I'd like to get rid of this this weekend. Weekend price is $300, sale goes off Sunday 25th at noon. My church doesn't start until 4 p.m. so i can travel up until noon that day. Willing to travel up to 1 hour from Anderson, SC to meet half way. That's one pretty looking mossy. So far away. Charlie, if you must have it I'll bring it, but if you'll pass I'm just going to keep it. That wood looks great. If you were closer I'd be tempted to buy it just to swap the furniture with the plastic stuff on mine. Your price is very aggressive. If you hold out a big I'm sure you'll find a more local buyer. Shotgun removed from the market. I'll keep it unless i get a deal too hard to pass up.